A news report today said that 70 million pictures are uploaded to Instagram every day. I’m kicking myself that, after spending 10 hours at the Baseball Winter Meetings in San Diego on Monday, not one of the 70 million pictures uploaded that day was from me. However, that was the only negative in an otherwise ultra-memorable day. When I first went into business for myself in January 2004, I was building demo and resume packages for sports broadcasters. Shawn was my second client ever and has been a member for most of the time since. He didn’t know me and I didn’t have any kind of track record but he trusted me. I will always be grateful. Finally, after nearly 11 years, I got to thank Shawn in person for the first time. When Bill smiles, you can’t help but also smile. He smiles with his whole face. Happiest smile ever. 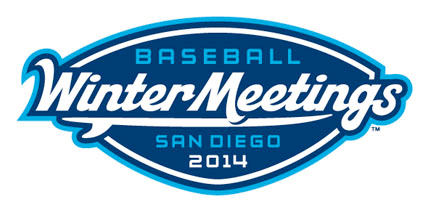 Kurt is a player agent and was attending the Winter Meetings on behalf of his clients. Our wives worked together several years ago in Orange County, CA but Kurt and I had only spoken once and it was over the phone. At the Meetings, he saw my name and the STAA logo on my name tag and asked if I was Amy’s husband. We ended up sharing a very enjoyable conversation. Mike has one of the coolest names on the STAA roster. I love saying it – Mike MONACO. Sounds very regal. Great dude, too. (Sorry about Everett Golson’s tank job, Mike). If I left anyone off either of these lists, please accept my apology. Certainly no slight intended. Maybe the coolest moment of the day was when, by random chance, I found myself standing with Mike Passanisi and Nathan Barnett. Mike is Assistant GM and Voice of the Altoona Curve. Nathan is Director of Broadcasting and Media Relations with the Myrtle Beach Pelicans. Both were students in the sports broadcasting class I used to teach at Palomar College in San Diego. This is the picture I most wish I had. You can tell the guys who are going to go far in life by the way they present themselves. They dress well, they have a firm handshake, they look you in the eye when talking to you and they speak with confidence. Trust me – there are a LOT of talented young broadcasters coming up through the ranks. The future of our industry is bright.